Confession time: I’m a little scared to raise a little girl. Don’t get me wrong. I’m excited about having a little girl, all the pink and glitter, ballet classes and general ‘sugar and spice’ that having a girl entails. It just seems like it’s so hard to be a girl and it’s getting harder. I keep hearing things like how third graders at a school nearby have lunch group therapy because the cattiness with the girls has gotten so out of control (although that might be the product of helicopter parenting), and I see more and more cattiness and just downright rudeness between little girls. And women as well. I mean, let’s just look at the whole mommy wars thing. Breastfeeding vs. formula, attachment vs. cry-it-out… We do it to each other. It breaks my heart. And I don’t know how to raise a kind, smart, confident, creative little girl that will grow to be a strong woman someday. But dammit, I’m gonna try. 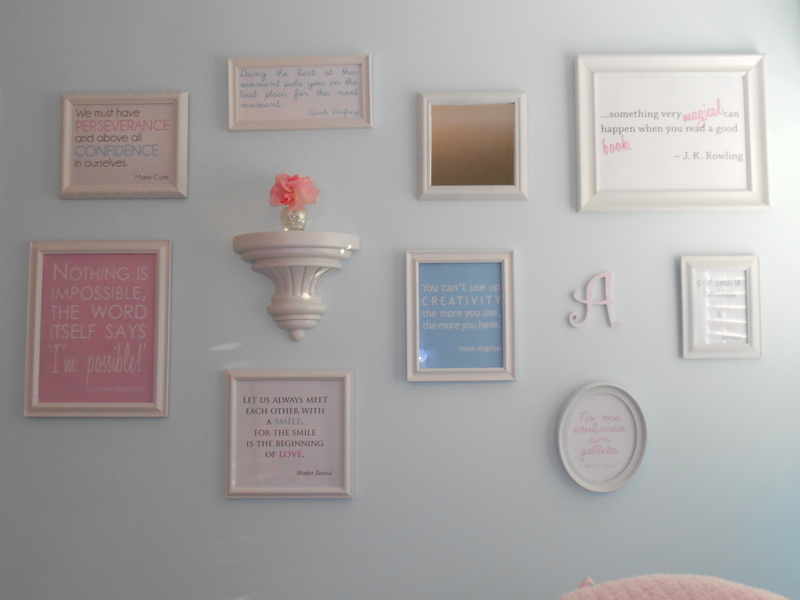 So when I was thinking of what to do in the nursery, I got an idea in my head of having a wall of wisdom, if you will. 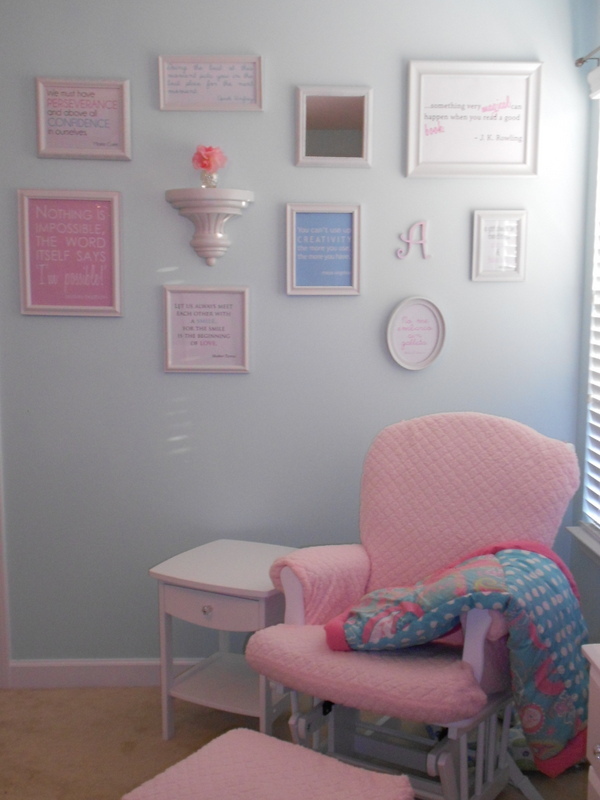 I looked for quotes from strong women that would reflect qualities I want my little girl to have – things like kindness, confidence, creativity, doing your best, reading… I thought it would be hard to find enough to fill a wall, but the hard part ended up being narrowing them down. The project was a lot of fun to do. I rummaged around my house, craft stores and Goodwill to find frames and my hubby and father-in-law spray painted them white. Once I had an arrangement I liked on the wall, I began designing what went where and how it would look. I ended up with a few other things that weren’t word frames: a corbal/shelf to which I added a little bud vase with a pink rose, a mirror to add some sparkle to that side of the room (and because it was $2 at Goodwill), and her initial. To design the word ‘art’, I used a free trial of Adobe InDesign. I love, love, love the Adobe Creative Suite. I miss it so much. I think that’s what kept me at my old job for so long. Sigh. But I digress. I channeled my inner design nerd and spent way too much time playing with fonts, sizes, kerning, spacing and all those fun things I used to do back when I worked 9-5. Finally, I had each frame the way I wanted it (mostly). Most I was able to print at home, but there were two that were too big for my printer, so I had them done at Office Max for a whopping $3 or so. I then trimmed everything down to size as needed and popped them into the frames. Admittedly, some of these have been all over pinterest and aren’t exactly novel, but they all speak to me. What I couldn’t find were quotes on travel/seeing the world, but got some travel-inspired prints for another wall in the room to give her that sense that there’s a world beyond our little town. Here’s another look from further away. I love how it’s part of the cozy little corner where I’ll be rocking her for hours and hours. I’ll admit that having these quotes on a wall in a room for a baby who can’t read may not make her a strong woman later on in life, but at the very least, it will inspire me to try to live up to these ideals and to work hard to raise a daughter that embodies these sentiments. This entry was posted in creativity, diy, inspiration, kid stuff, parenting and tagged frame wall, nursery decor, wall art on October 13, 2012 by aliciamariel.